The Magazine of the Week is the first issue, Fall 1929, of Science Wonder Quarterly. After Hugo Gernsback was ousted from control of Amazing Stories in 1929, he promptly created the Wonder line of science fiction magazines. This group of magazines included Air Wonder Stories and Science Wonder Stories, soon combined and retitled Wonder Stories, as well as Science Wonder Quarterly, soon retitled Wonder Stories Quarterly. The quarterly titles disappeared within four years, but Wonder Stories, later called Thrilling Wonder Stories, remained in print through 1955. Of the earliest issues of the Wonder magazines, this first issue of Science Wonder Quarterly is my favorite, because of the cover art by Frank R. Paul, illustrating the story "The Shot into Infinity" by German author Otto Willi Gail. The cover shows a rocket ship passing by the moon, with astronauts in spacesuits floating nearby and connected to the ship by flexible tethers. Incredibly, this is an accurate depiction of a modern space walk, two generations before such a thing ever occurred. (Well, accurate except that you can't do a space walk while your ship is madly firing its rockets, but we have to cut these guys a little slack.) Note how the top astronaut's suit is bulging out. The fellow is not chubby; writing and drawing in the day of propeller airplanes, Gail and Paul correctly anticipated how spacesuits would need to be pressurized to operate in the vacuum of space. Now look at the stubby little wings on the sides of the spaceship. Gail's story describes the ship using rockets to lift off, but then coasting back to earth like an airplane. Believe it or not, you are looking at an image of the space shuttle, drawn over fifty years before NASA built the thing. 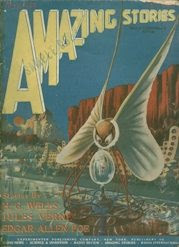 The Magazine of the Week also contains "The Artificial Man," a story anticipating artificial organs by Clare Winger Harris, one of the earliest women to write science fiction (sometimes inaccurately called the first woman SF writer); and "The Hidden World," an early story by Edmond Hamilton, who went on to a very successful and prolific career in the science fiction pulps. 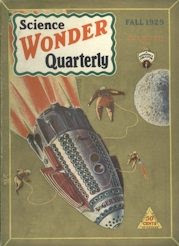 The Wonder magazines were the second entry in the science fiction genre created by Hugo Gernsback. Next week you will see the third magazine to enter the field, and the first one not created by Hugo Gernsback. Amazing Stories was initially published and edited by Hugo Gernsback. Gernsback had previously published various non-fictional popular science magazines. When he inserted a few fictional futuristic stories (including his own Ralph 124C41+) in those magazines, the very positive reader reaction prompted him to start a magazine specializing in the stuff. As a result of that decision, Gernsback is often called the founder of modern science fiction. While there were novels and stories before 1926 that we now categorize as science fiction, until Gernsback started Amazing Stories, the term science fiction (or the variation Gernsback preferred, "scientifiction") did not exist. More importantly, there was no separate publishing category for the kind of work we now call science fiction. It is not an overstatement to say that with Amazing Stories, Hugo Gernsback created the genre of science fiction. To this day, the most prestigious award given out annually in the field of science fiction is unofficially called the "Hugo Award" in Gernsback's honor. As shown on the cover of the Magazine of the Week, Amazing Stories initially consisted largely of reprints of work by H.G. Wells, Jules Verne, and Edgar Allan Poe (whose name is misspelled on the cover). Within a couple years, however, Gernsback shifted the magazine's emphasis to original work by new writers. Amazing Stories was an instant success, and remained consistently in print from 1926 through 1995 (and there have been a couple attempts to resurrect the title in the past decade). Despite the magazine's success, however, the parent company of Amazing Stories went through financial difficulties in the late 1920's, which resulted in Hugo Gernsback losing control of the magazine. So Gernsback turned around and created the second science fiction magazine ever published, an issue of which you will see next week. The Book of the Week is The Cyberiad by Stanislaw Lem (1921-2006). The Cyberiad was first published in Poland in 1965. The Book of the Week is the trade paperback printing of the 1974 Seabury Press first edition of the English translation, cover art by Daniel Mroz. The Cyberiad is an example of Lem's satires, many of which were inspired by the political systems he lived under. Lem survived the Nazi occupation of Poland, concealing his Jewish heritage and working as an auto mechanic, sabotaging Nazi vehicles. He published most of his work while Poland was under communist rule. While he did have occasional run-ins with the state censors, Western readers often marveled that he was able to get most of his satirical work published, and very widely read, in Eastern Europe and the Soviet Union. Apparently his choice to write in the science fiction genre, which party officials did not seem to understand might make real-world statements, combined with his remarkable facility with language allowed him to get his point across without alerting the censors. Unfortunately, readers in English are in a poor position to judge Lem's way with words, since much of his work in English has been translated not once but twice, first into German or French and from that into English. The Cyberiad is an exception, translated directly from Polish by Michael Kandel, whose skills as a translator are evident. The first portion of the book, for instance, involves an inventor who creates a machine that can make anything that begins with the letter "n", and trouble commences when someone tells it to make nothing. This passage is very funny in English, even though the translation must have been a n-nightmare. If we can keep any more of the leading voices of science fiction from dying this week, we will return to our oft-postponed history of the pulp magazines next week. For the Hugos awards, written fiction is divided by length into four categories. Novelette is the category shorter than novels and novellas, but longer than short stories, 7,500 to 17,500 words in length. For the Hugos, written fiction is divided by length into four categories. Novella is the category immediately shorter than novels, 17,500 to 40,000 words in length. 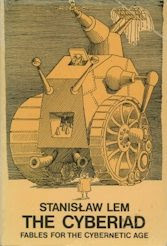 The Book of the Week is The Invincible by Stanislaw Lem. Once again we are postponing our history of the pulp magazines in favoring of honoring a fallen master of science fiction, this time Polish author Stanislaw Lem, who died last week at the age of 84. Science fiction is largely an English language phenomenon, and very few significant works of SF have been written in other languages. Stanislaw Lem was an important exception, probably the most influential SF writer to write in another language since Jules Verne. Lem's books have been translated into over forty languages and sold tens of millions of copies worldwide, and he is one of the most widely read authors ever in Eastern Europe. While most of his 30+ books have been published in the United States, he remains best known here for his novel Solaris, adapted to film in the Soviet Union by Andrei Tarkovsky in 1972 and in America by Steven Soderbergh in 2002 (with George Clooney in the starring role). Lem disliked both film versions. The Invincible is currently in early film production, and it is a shame that Lem will not be around to denounce this new movie. The Invincible originally appeared in Polish in 1964 The Book of the Week is the first printing, paperback original of the English translation, published in 1973. Like Solaris, The Invincible tells of mankind's first contact with a strange form of alien life. In Solaris, the life form is a sentient ocean; in The Invincible, it is a society of autonomous nanomachines. As the cover suggests, these machines can be a bit hostile. The Invincible is an example of one portion of Lem's work, dealing with space exploration and contact with other races, but with a strong focus on the emotional and ethical ramifications rather than the technologies involved. Another portion of his work is heavily satirical. Next week's Book of the Week will be an example of Lem's satire. This month's silent movie is The Merry Widow (1925), running time 137 minutes, based on the 1905 operetta of the same name by Franz Lehár. Many characters and scenes were changed in this Hollywood adaptation. The director, the talented and controversial Erich von Stroheim, is co-credited with writing the screenplay. The movie stars Mae Murray and John Gilbert. Mae Murray was a Ziegfeld Follies dancer with frizzy blonde hair. John Gilbert was a matinée idol of the 1920s. The setting is the fictitious kingdom of Monteblanco. John Gilbert plays likable ladies' man Prince Danilo Petrovich who falls in love with American dancer Sally O'Hara played Mae Murray. Sally O'Hara also attracts the attentions of Danilo's cousin, the obnoxious Crown Prince Mirko (Roy D'Arcy). After a memorable evening, Danilo asks Sally to marry him. But the King and Queen, upon hearing Danilo's plans, forbid the marriage. Thinking she was jilted, Sally marries rich, old Baron Sixtus Sadoja (Tully Marshall). The Baron dies soon after. After a mourning period, Sally emerges as "The Merry Widow" in Paris. The King and Queen of Monteblanco don't want the Baron's millions to leave the kingdom. Egotistical Crown Prince Mirko goes to Paris to woo Sally, and Prince Danilo, who still cares for Sally, follows him. The Merry Widow shows men dressed in uniforms covered with medals, and ladies in fabulous gowns and feathers. There is unheard waltz music, dance sequences, interesting crowd scenes, plot twists, and exotic details. It's an entertaining, well-done step away from reality, where you cheer for the hero. There's even a duel. The Merry Widow was one of the top films at the box-office in 1925. Trivia: Joan Crawford and Clark Gable were extras in this film. 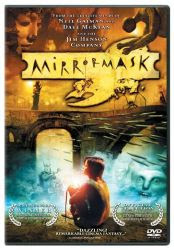 So, I watched the movie "Mirrormask" for the first time last night. If you haven't seen it, or haven't heard of it, it's something you really ought to seek out. It's a film that was the result of a collaboration between Neil Gaiman, Dave McKean, and the folks at the Jim Henson Company (trust me, not a single Muppet made it into the film). I thought it an extraordinary piece of art--visually stunning and innovative, disturbing and funny in equal measure. The story...well, the story is thin and conventional, but it's built into a film that takes visual effects to a new and completely uncharted level. The humor is very much Neil Gaiman's, which I love, and which can carry me through the biggest plot holes you can imagine. And the film also has the single most disturbing use of a Carpenters' song EVER. Do yourself a favor, check it out and lose yourself for a couple of hours.